The yarn produces a fabric that has wonderful drape and feels cool, despite its weight. On several of my skeins, the paper band didn't catch all of the strands of yarn, which meant that I thought I was setting the skein out properly before trying to wind, but I wasn't. So I had the most awful time winding these skeins up until I realized what was happening. The other thing to note is that this is a tape yarn, and as such, you will run into problems with it twisting up on you. I wasn't trying to keep it perfectly straight or anything, but every once in awhile, I'd have to stop to untwist when the corkscrews that were developing got too bad. Notes: This pattern comes from Norah Gaughan Vol. 2. The booklet is divided into two different sections, "Objet d'Art" and "3 for All." The latter has clever variations for three different projects. This particular set of variations is named for the 3 musketeers. I chose to knit the bodice for Athos, and I was going to substitute making the sleeves from Porthos instead. However, it turns out there was a mistake in the booklet, and the printed directions for both Athos and Porthos were the same. While I was waiting for the corrections to be posted, I finished up the body of the garment and after trying it on, I decided I actually liked it best as a sleeveless tank! So I just finished off the armhole edges with single crochet, and voila!...it's D'artagnan, the 4th musketeer! Now, I did this as an afterthought. 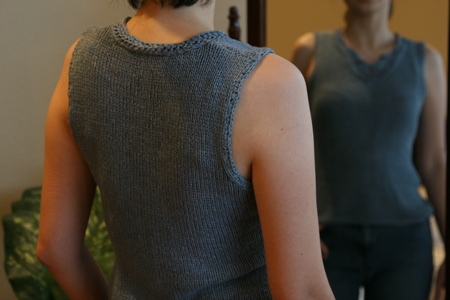 If you were to set out to make a sleeveless tank, you might consider binding off slightly fewer stitches for the armhole, just to ensure you have enough coverage. As an aside, I think it might also have been interesting to pick up stitches along the upper front and back armholes and work a medallion for a sleeve cap--an effect similar to Anais, I think. The only other modification I made was to add 1" between the waist shaping and the armhole. 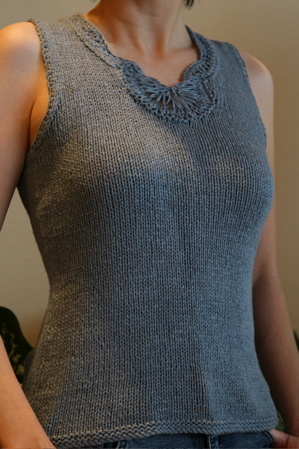 I wanted the top to be a little longer, and I decided the best place to put the extra length was above the waist shaping as it would otherwise have sat kind of high on me. This pushed it down closer to my natural waist, which I prefer. You are such a speedy and focused knitter! Beautiful work--I love this. It's making me very tempted to get a copy of this book.